As you know, Lynne and I worked pretty hard over the summer to stockpile sufficient fire wood for the winter. 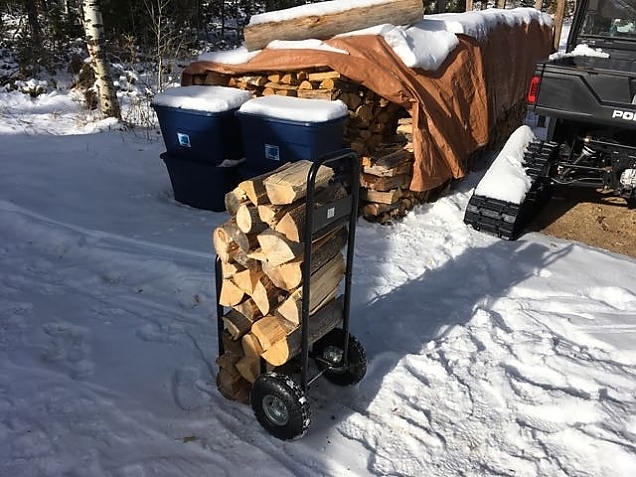 We have a wood dolly that we use to haul wood to the front porch where we stockpile about 1/2 cord. We heat the cabin throughout the day and evening with wood in the wood stove. And, it is nice to have a fire in the open hearth fireplace occasionally. The cabin looses about 1° per hour overnight, so if we can start with a temperature of 70° or so when we go to bed (usuallly around 9:00), then it is around 60° when we get up. The thermostat on the propane forced-air heater is set to keep the cabin at 60° from 10:00 p.m. to 6:00 a.m., then to raise the temperature to 65°, where we keep it all day. If it is windy, we lose heat a bit faster because we are still tracking down all the little leaks we have around windows and doors. So far this year, we have been using wood stored on the front porch that is probably 10 to 12 years old! But, this week we used the last of that and had to start using the wood we cut this summer. We had planned to cut, buck, split and stack 7-8 cords, but only got a bit more than 6 cords done. We are not sure if that will get us through the winter. We'll see. 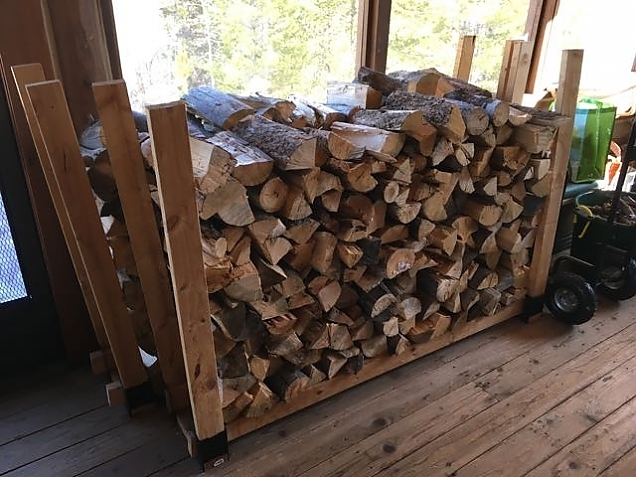 So, on a nice day, we got out our wood dolly that handily hauls many armloads of wood in a single trip, and restocked the front porch. The dolly is built to carry split wood and can carry quite a bit. 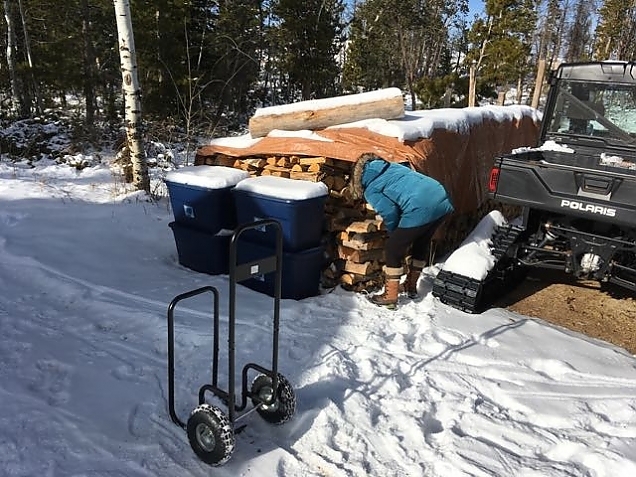 The large wheels make it easy to pull it up over the two steps at the door and we just pull it through the cabin to the front where we have some wood racks. It save many trips through the cabin with armloads of wood. The dolly loaded with wood. Wood storage on the front porch. We are experimenting with one other fire wood management subject: how to deal with the large amounts of sawdust created while bucking the wood. We probably created enough sawdust to fill a 55 gallon drum. We can't just leave it laying around because it does not go anywhere (unless the wind blows it). The dogs like to roll in it, we track it into the cabin, etc. So, I've collected most of it and put it in a large black trash bag. I then poured about a quart of lamp oil over it and stirred it around. (Diesel fuel may be a better option.) 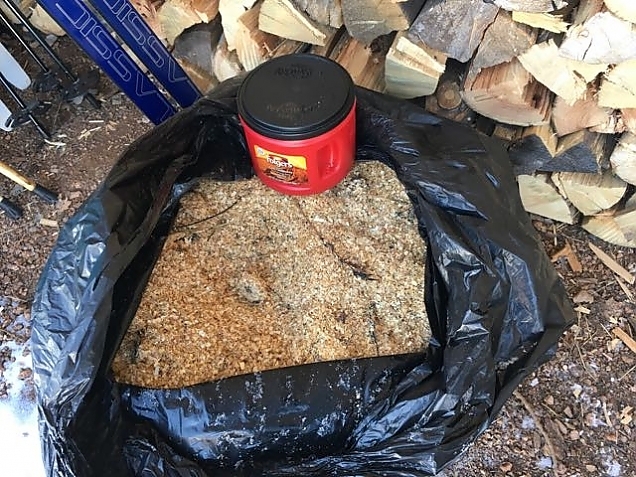 I allow it to "cure" in the plastic bag, and take out some into an empty coffee can to sprinkle in the fireplace to help start a fire. We've only started using it, and we still use some paper and pinecones, so am not 100% sure if it helps. But, it is a way to get rid of the sawdust. It is called "firedust". A black plastic bag filled with firedust. Previous entry: Winter Provisioning is Done!